Brian knew his subject matter as well as anyone out there, a real craftsman -- not to mention just an all- around nice guy. If you're a regular reader of No Jitter, you're probably familiar with the work of Brian Riggs, who's been a contributor since we started the site in 2007. At least I hope you're familiar with his work, because Brian's work was always worth reading -- it was detailed and insightful, and when you finished reading one of his posts, you were smarter than you were before you started it. You'd probably also gotten a chuckle along the way at his dry, witty style of writing. 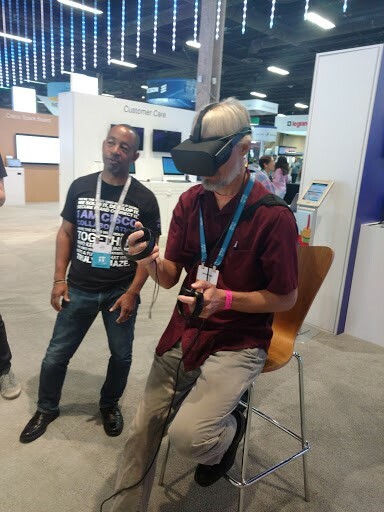 Brian playing around with virtual reality at a vendor conference last year. Brian died over the weekend after a snorkeling accident in Laguna Beach, Calif. He was only 52 years old. One of our other bloggers, Dave Michels, was a close friend, and has written a lovely tribute to Brian on his TalkingPointz blog, which you can find here. As I said, Brian was with us from the beginning on No Jitter. In fact, I first started working with him when we had a pre-No Jitter site called VOIPLoop. Brian's writing always came in so pristine, so well-executed, that the editing part took almost no time. That spoke to an integrity and a pride of craftsmanship that said a lot about Brian's character. He knew his subject matter as well as anyone out there, and he knew how to present it in an understandable, straightforward way. He was just damn good at what he did. I second all the other things that my friends and colleagues in the industry are saying about Brian today: He was one of the nicest people I've ever met. He had a range of avocations and talents that made him one of the most interesting people I've ever met. He'll be missed. This is a hard loss to take. My deepest sympathies, and those of the entire Enterprise Connect and No Jitter teams, are with Brian's family, friends, and colleagues.